JNN 23 Jan 2015 Riyadh : Saudi Arabia’s King Abdullah bin Abdulaziz Al Saud has died at the age of 90, according to Saudi media. An announcement, made by state TV early on Friday, also said that his 79-year-old half brother, Salman, has succeeded him. “His Highness Salman bin Abdulaziz Al Saud and all members of the family and the nation mourn the Custodian of the Two Holy Mosques King Abdullah bin Abdulaziz, who passed away at exactly 1 a.m. this morning,” said the statement. The king reportedly died at hospital, where he had been receiving medical treatment for several weeks. 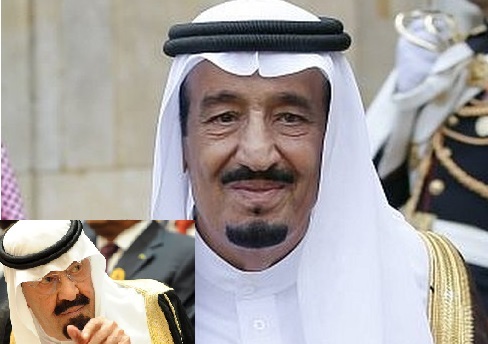 The late Saudi king’s funeral ceremony will be held on Friday afternoon. The official statement further noted that the late king’s half brother Muqrin who is in his late 60s, has been named the new crown prince. The new Saudi king has reportedly called on the royal family’s Allegiance Council to recognize Muqrin as his crown prince and heir. All three are sons of the founder of modern Saudi Arabia, King Abdulaziz, usually referred to as Ibn Saud, who died in 1953. King Abdullah, who was admitted to the King Abdulaziz Medical City in the capital Riyadh in late December,had been in hospital for several weeks suffering from a lung infection. and was reportedly breathing with the help of a tube. Examination “revealed pneumonia, which required the provisional insertion of a tube,” the Saudi royal court said in a statement on January 2. The Saudi king had two operations in October 2011 and November 2012 because of “ligament slackening” in the upper back. The Saudi king’s death has raised concerns about the future of the oil-rich country in the face of anti-government demonstrations. Salman was named Saudi crown prince in June 2012 after the death of Prince Nayef bin Abdul Aziz. Salman has recently represented King Abdullah at most public events because of the monarch’s ailing health. King Salman spent 48 years as governor of Riyadh Province before becoming crown prince and defence minister. In a recent meeting with Media Correspondent in Jeddah, he appeared alert and well-briefed but walked with the aid of a stick . It is believed that the late Saudi king was born in the Saudi capital, Riyadh, in August, 1924. There is, however, controversy over his actual birth date. He was appointed as the commander of the Saudi National Guard in 1962 and 20 years later was named as crown prince and first deputy prime minister. He became the king of Saudi Arabia in August 2005 following the death of King Fahd, who had succeeded King Khalid in 1982. Abdullah was the 13th of the 37 sons of King Abdulaziz. This entry was posted in Middle East and tagged Abdulaziz Al Saud, Abdullah bin Abdulaziz, King Abdulaziz, King Abdullah, King Abdullah bin Abdulaziz, KIng Salman, Saudi Arabia. Bookmark the permalink.